Composed by Robert Palmer. Score only. Duration 7:00. 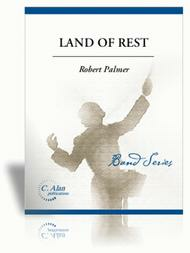 Published by C. Alan Publications (CN.06421). Land of Rest is dedicated to the victims who lost their homes and loved ones in the floods of Hurricane Floyd. Beginning and ending darkly, the middle of the piece utilizes the American folk hymn-tune "Land of Rest" to provide a simple and beautiful contrast. Land of Rest is dedicated to the victims who lost their homes and loved ones in the floods of Hurricane Floyd. The title of the composition is also the name of the American folk hymn-tune which is introduced in the middle of the piece. This simple but lovely melody provides a contrast to the darker beginning and end of the composition. The piece was commissioned by a consortium consisting of the Zeta Psi chapter of Phi Mu Alpha Sinfonia, East Carolina University; the E.B. Aycock Middle School Band, Greenville, NC, Mike Pollard, conductor; and the East Carolina University Bands. The piece was writted for the East Carolina University Wind Ensemble, Dr. Scott Carter, conductor, and was premiered by that group on February 1, 2002.